This section outlines the main elements on the ThinkCMS SiteManager administration area. The main menu shows all the modules installed on your site. From this menu you can access and manage each module by clicking on the items displayed. In your regular site administration activities, this is the menu you will be using the most. If it is not activated or you are browsing the admin area from your mobile phone or tablet, by default the menu is collapsed. 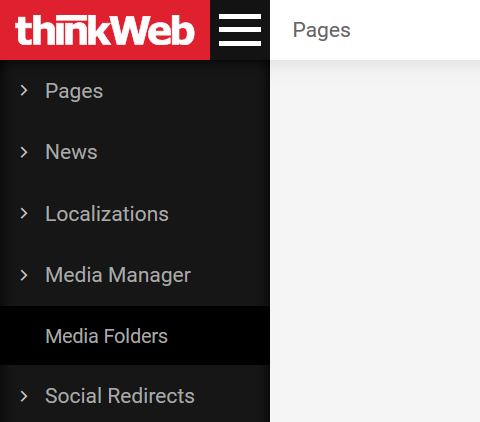 To show it click on the menu icon next to the red ThinkWeb logo on the top left part of the screen. To hide the menu click the same icon again. On larger screens the main menu is persistent, meaning if it is opened it will stay opened after you navigate on the next page. 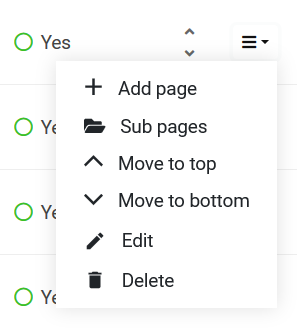 If you wish to keep the menu hidden to free more space on the screen, you can alternatively show the icon by moving your mouse near the left edge of the browser window. Next to the main menu the name of the module you are currently in is displayed. Please note, that if your installation has many modules not all will be visible and you can scroll down the menu to find the module / section you are looking for. The system menu is located on the top right part of the screen. Dashboard - shows the dashboard. Settings - different settings related to your website. Tools - access the system tools and other maintenance modules. Administrators - manage the back-end admin users. View site - opens the website home page. In the top right corner the name of the currently logged in user is displayed. For each listing item there is a menu available on the right side of the row that can be triggered by clicking the menu icon with the dropdown sign. For more information visit the listing help page.